Selinda's 9 spacious, luxury tents are erected under cool thatch canopies, with all units having exceptional views across palm-studded floodplains. Each tent has en-suite facilities, a stone bath being the highlight. The bathroom is uniquely "open air" with lots of natural light, yet is screened and virtually insect-proof. The tents are spacious and beautifully appointed with furniture and features that have been collected from around Africa. 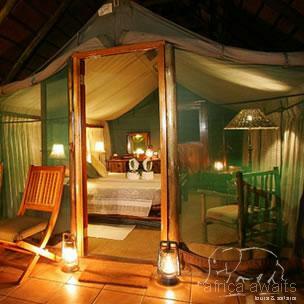 Four-poster mosquito nets and overhead fans are standard. The main area comprises a series of expansive decks that invite soaking up the spectacular views and wildlife that are a visual constant of the camp. 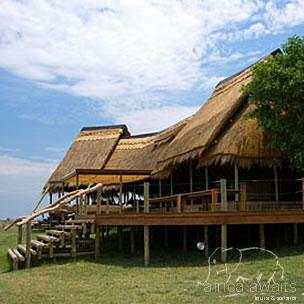 The design of the main area is such that there is never a barrier to these views: whether guests are relaxing in the lounge, having brunch under the cool shade of the uniquely designed thatched roof, or sampling the fine cuisine of a three-course dinner on the open "star deck". Set apart from the main area is the photo/art gallery built above a temperature-controlled wine cellar and curio shop. Guests can also enjoy a small plunge pool and the traditional campfire. The Selinda is characterised by its game-rich floodplains which are host to a variety of bird life (300+), antelope, zebra, cheetah, wild dog, lion and dry season elephant concentrations. Nocturnal species could include serval, porcupine, springhare and possibly leopard. 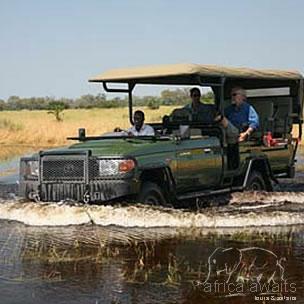 Daily activities revolve around morning, afternoon and night game drives with experienced, professional guides in custom-built 4x4 Land Cruisers. Short walks from camp accompanied by a guide are encouraged to get to know some of the Selinda's smaller creatures. With your holiday, safari or business trip from in to Selinda Camp in Botswana.